Dr. J. Christopher Farmer has been helping to advance the field of Critical Care Medicine from its inception 30 years ago as a recognized subspecialty certification by the American Board of Internal Medicine (ABIM). Dr. Farmer has served in the U.S. Air Force, is engaged in a number of international projects to improve critical care, and is Chair of the ABIM Critical Care Medicine Board. ABIM Vice President of Medical Research Dr. Lorna Lynn recently spoke with Dr. Farmer about the past, present and future of critical care medicine in our latest podcast celebrating the certification’s 30th anniversary and the physicians who dedicate their careers to life-saving medicine. Dr. Lynn: Hi. I’m Lorna Lynn—an internist and the Vice President of Medical Education Research at the American Board of Internal Medicine. You might know us as ABIM. I’m here with the Chair of the Department of Critical Care Medicine at Mayo Clinic Arizona and Chair of ABIM’s Critical Care Medicine Board, Dr. J. Christopher Farmer. Welcome Chris. Dr. Farmer: Thank you very much, Lorna. I’m very glad to be here with you today and I look forward to our conversation. Dr. Lynn: So, as some of you listening may remember, the organization just celebrated its 80th anniversary. 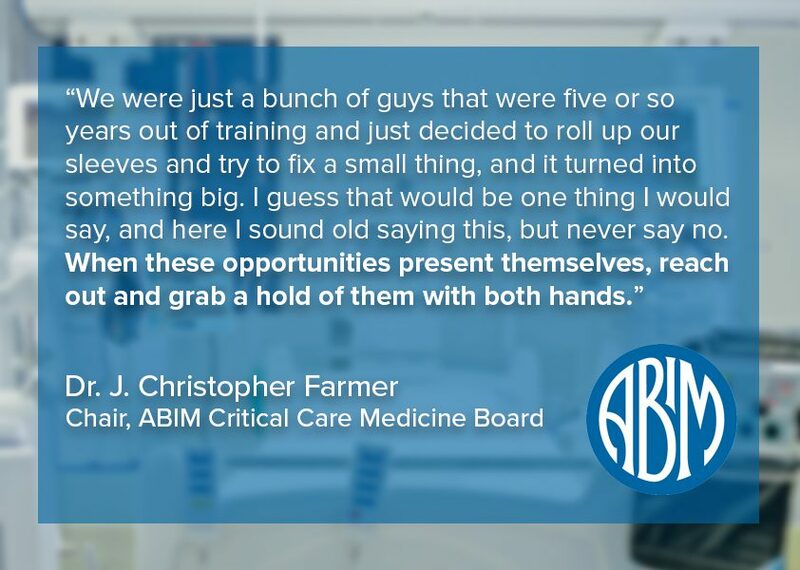 ABIM was founded in 1936 by a group of physicians working together to set standards for internal medicine practice, but what some of you may not know is that the Critical Care Medicine subspecialty is also celebrating an anniversary. Chris, could you tell us more about this? Dr. Farmer: Yes, that’s right Lorna. Thank you… 1987, so that was the first time we had a Critical Care Medicine board exam, and at that time, it was actually considered “added qualifications.” It wasn’t even a board certification. And, we were probably, oh gosh, close to twenty years in before it became a full-up board certification. So, I took it for the first time straight out of my fellowship in 1987 and have been ringing the bell every ten years since then to re-take the exam and will be taking it again next month for the fourth time. Dr. Lynn: Wow. You know, critical care medicine seems like such an important part of every hospital everywhere today. Can you explain why it was essential to establish an official subspecialty in which physicians can be board certified? I mean, it’s hard to imagine it wasn’t always that way. Dr. Farmer: Yeah, critical care has had somewhat of a tumultuous course. There are a lot of different groups that rightfully claim ownership to critical care, from various different specialties, not just from internal medicine but from surgery and anesthesia and so forth. So, from the adult side, it’s been a little unclear as to what we should be doing for board certification. From the ABIM, it’s very important. If you look at the day-to-day practice of how we take care of patients in a hospital, what we see is an increasing complexity of those patients and an increasing, higher acuity of illness for a greater percentage of the patients who are hospitalized. In that regard, critical care is a crossroads. It’s a nexus point, and so much of what we do is built on trust. We have terms about open and closed ICU’s but really those don’t have much relevance in today’s world and how we practice critical care. What’s more important in the bond of trust, because we work side by side as critical care specialists with other specialties to help them co-manage their patients, and these are not just internists, but surgeons and surgical subspecialists as well. So, it’s very important in that trust that they know and understand, “What is the skill set? What is competency, and how can we know that this person I’m working with can actually do what they’re saying?” And, the ABIM credential is vitally important in that regard. Dr. Lynn: I think I’ve told you this before, but I am married to a pulmonary critical care physician, and I hear at home about the advances in the field in recent times, that he is doing things now that he wouldn’t have dreamed of even just ten years ago. I also know that, here at ABIM, we have folks who come through Critical Care Medicine certification who start in internal medicine and go to pulmonary but some come from ID, and I think your own background is that you came straight from internal medicine into critical care. Is that right? Dr. Farmer: Yeah that is correct. I think a lot of us pick our specialties based on role models. So, I was a brand new intern in internal medicine, and this guy moves across the street from me who was an intensivist who had done exactly the same pathway, and I just revered him and have followed him throughout my career trying to follow in his footstep and contribute in the same ways that he has. That’s how I got to critical care. I actually planned to be a cardiologist. Dr. Lynn: Well we’re glad that your life took the turns that it did, because it’s very clear that you’re passionate about critical care medicine, and passion is an important part of the work that we all do. I also happen to know that you are very service-oriented and that’s another thing that drives the work you do in various aspects. 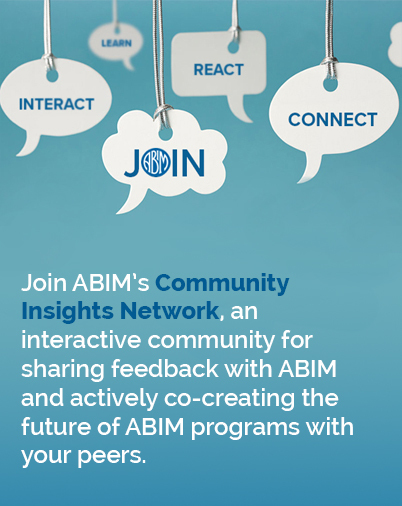 Could you tell us a little bit about how you decided to get involved with ABIM and what your relationship with us has been like? Dr. Lynn: That’s the Self-Assessment Program committee. Dr. Farmer: Yes, I’m sorry. You’re right, self- assessment– both as a member and also the chair of that group. The last two years, with the new governance structure with the ABIM, I’ve been on the [Critical Care Medicine] board and now chair that. Dr. Lynn: Well we’re very lucky to have physicians like you who have brought so much experience to ABIM and been involved in so many aspects of what we do. Now, I know that another aspect of your career was military service. You served in the Air Force. Is that right? Dr. Farmer: Yes, that’s correct. Dr. Lynn: So, first of all, I want to thank you for your service to our country and to the men and the women in uniform whose lives you’ve changed. I know a little bit about the work you’ve done to decrease mortality on the battlefield, but I would love for you to tell us all about the Critical Care Aeromedical Transport Team program. Dr. Farmer: Yes, that’s twelve years of my life out of a twenty-plus year career in the Air Force. I think we all have opportunities that come along and sometimes we recognize them for what they are and other times you kind of back your way into it. I was very fortunate to work with some incredibly bright, talented individuals in critical care, and a group of us looked at how we moved patients through the Aeromedical Evacuation System that were critically ill and injured. It was largely a Vietnam-era system at the time. So, maybe I had a little more time than they did to work on this, but I was the lead for the project for the first half a decade or more. We built and developed, out of backpacks, a portable critical care team, and it has grown and evolved. It does ECMO—extracorporeal membrane oxygenation—and other things all in the back of an airplane, and can just make an ICU out of anything. It’s now become the largest critical care transport system in the world. None of us saw that when we were doing it. We were just a bunch of guys that were five or so years out of training and just decided to roll up our sleeves and try to fix a small thing, and it turned into something big. I guess that would be one thing I would say, and here I sound old saying this, but never say no. When these opportunities present themselves, reach out and grab a hold of them with both hands. Dr. Lynn: So it sounds like you brought critical care to the battlefield instead of hoping that the service people would be able to make it to critical care somewhere distant. Is that right? Dr. Farmer: Yeah, that’s correct. You know just as an aside, when all of this started, I had some misgivings about this, because, well, none of us in healthcare are advocates for battle and for war and those things. So, I had to process that philosophically, “Is that okay? Am I condoning those things or working with that?” But for we in healthcare in the military, we had no real role in causing those things to happen, and it was an opportunity to limit the extent of the injury with that. And by bringing this into play, there was always a capability to take care of trauma patients very close to the point of injury, but now what do you do with these folks? How do you move them out of that area when you’ve already started something, and you have limited resources? So this is something where the critical care team filled that hole, and allowed other aspects of the military care system to move forward and do more things. And in fact, when they look at the statistics of people that die from their wounds, they’re some of the lowest that they’ve ever been in the history of military medicine. So, all of us that were involved with that feel very good about that, that we’ve made a positive difference for those folks. Dr. Lynn: It’s really incredible and know that the families of those you’ve helped are incredibly grateful to you even if they don’t know the name of the person who led the team behind these changes. Dr. Farmer: You know what? That’s even better, because then you’re doing it for the right reasons. Dr. Lynn: Now, I’ve heard that more recently you’ve been co-leading a joint project that’s directed to improving sepsis care in nations that don’t have the same kind of resources that we have here in the United States. I understand that this project brought together the European Society of Intensive Care Medicine and our own Society of Critical Care Medicine. Could you tell us a little more about that and how you initially got involved in that project? Dr. Farmer: Sure, I’d be happy to. So, for those in critical care or with a large hospital focus, they know about the “Surviving Sepsis” campaign and the bundle of care and those types of things. Well, that was a good thing, but that’s for industrialized countries. You can’t be in the middle of a resource-limited circumstance and check like lactate levels or central venous oxygen saturations or other things that are part of the bundle. So, we looked at that and the realization came to us that the best critical care is the critical care you never need. So, we actually thought that a system that aimed at identifying patients at risk for developing sepsis before they develop that, so pre-hospital, at a dispensary level would be a better approach. So in 2013, we brought a group of folks together, about eighteen or twenty of us from around the world, and we’ve been working on it since that time to develop a bundle and a process that can be templated. We started in Rwanda, at a teaching hospital at Gitwe, Rwanda. And in fact, we just finished in March of this year, 2017, with the initial phase of data collection and the pilot project, almost 2,000 patients. We’re analyzing that right now, and the focus is on early identification and education of providers. If you wait until they’re in the ICU, it’s too late. So, our hope is that we’re going to come up with a process, and it’s got a sepsis first aid kid and an education package and other things that will enable us to identify these patients earlier in their time course, and actually nip it in the bud before a serious infection becomes full-blown sepsis. Dr. Lynn: You know, Chris, you have done so much amazing work in your career, from working with the trauma patients in the Air Force to the what you’re doing now in your daily work back in Arizona. I wonder what you think about the future of critical care medicine and what you imagine you might be saying to someone thirty years from now who might be just starting out in the field. Dr. Farmer: Yeah, it’s going to be an exciting ride. As much as it’s changed in the thirty years that I’ve been involved with it, I actually think that it’s just now getting to the steep part of the curve, where there will be even bigger changes than what we see. I can tell you what I’ve seen in thirty years broadly speaking, the density of very high acuity, high complexity patients in the ICU has increased non-linearly. We’ve always had really sick patients, but for every one of those there would be several that were ICU-sick but not like that. Now, we go bed to bed to bed and every one of them is just catastrophically sick that we’re taking care of. I think that’s going to push us forward. What we’ve learned and we’ll continue to learn is that all these novel therapies we have for patients, they make a difference for some, but what’s really made the biggest difference is how we collaborate, better communications and better team work. I think that will continue to expand and there are some new technologies that are coming. So for those coming that are in the first part of their career now, I think that they’re going to have a great time. Dr. Lynn: That sounds like good advice for all of us but especially for those, like you say, at the start of their career that have the potential to touch to many lives and to save so many lives. I really want to thank you for taking the time to be with us today and share a little bit about your amazing career. I want to thank you for the service that you give to us at ABIM as a member of our governance, for the way your serve your colleagues every day, and especially for what you do for your patients. Dr. Farmer: Thank you very much. If I could just say one thing about the ABIM: There are things that we all have that are career highlights, and clearly for me, the decade and a half plus of service of being allowed the privilege of working with the ABIM unquestionably has been one of the career highlights for me, and I’m very grateful for that opportunity. Dr. Lynn: We’re grateful too, Chris. Thank you so much. Dr. Farmer is a board certified internist and critical care physician. He is Chair of the American Board of Internal Medicine (ABIM) Critical Care Medicine Board and served on the ABIM Critical Care Medicine Self-Assessment Committee. He serves as Professor and Chair, Department of Critical Care Medicine, Mayo Clinic Arizona. Dr. Farmer is a retired Air Force Colonel and Professor of Medicine and Surgery, Uniformed Services University of the Health Sciences, F. Edward Hebert School of Medicine. He is one of the founders of the Department of Defense Critical Care Aeromedical Transport Team program, the largest critical care transport system in the world. He also served as the Special Assistant to the Air Force Surgeon General for Homeland Defense and Medical Preparedness. Dr. Lynn, a board certified internist, is Vice President of Medical Education Research at the American Board of Internal Medicine. Dr. Lynn’s first involvement with ABIM was as the Medical Secretary for the Internal Medicine Exam in 1995. During her tenure at ABIM, Dr. Lynn has worked on the development of numerous practice assessment tools, and on research related to those tools. She has leadership responsibility in providing clinical oversight for ABIM’s evolving approaches to assessment. Dr. Lynn has served on committees of the National Quality Forum and the Institute of Medicine addressing care coordination, interprofessional education, and conflicts of interest. She is a member of the Board of Directors for the American Board of Family Medicine.